Obama is making burgers on the grill! He said he needs some help making enough for everyone, so you are specifically invited to the White House for Obamas' first burger BBQ cookout. 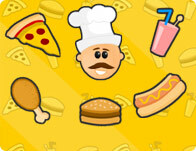 Since you are a burger-flipping master, they need your help to finish this meal!